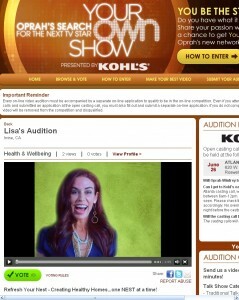 Lisa Auditions for Oprah’s New Network! Refresh Your Nest – Creating Healthy Homes… One NEST at a Time! I’m SOO excited! In case you haven’t heard – Oprah’s big search for the next star to host their own show is underway and I’ve applied! This is where YOU come in :) I need as many votes as possible (you can vote every day between now & July 3rd) so PLEASE show your support so I can continue to spread my message of creating healthy homes all across the USA! Together with your help, we can do this! Click here to watch my video and VOTE. A BIG thank you in advance!!! With a natural charisma and insatiable passion for improving the lives of others, Lisa has been a guest expert on shows such as the Today Show, The Doctors, Chelsea Lately, and more! Join Lisa Beres, Author, Baubiologist, Certified Green Building Professional, and founder of Green Nest, on a journey to inspire, educate and improve the health of homes all across the USA! She’s going beyond green and undercover, into your home to find out what you and your family are really living with. 22 Million Americans suffer from asthma and millions more with allergies – are you or a loved one included? Not for long! Why is it okay that our own EPA admits indoor air is 2-5 times MORE polluted than the outdoor air? Not if Lisa & her team can help it! She’ll make it fun, entertaining and life changing as she and a healthy home dream team of experts help you THRIVE and not just survive! Then, you & her team will pay it forward to another family in need. Please vote for me EVERY DAY and tell your friends! Every vote counts and I promise you – I will deliver for you!!! I would love to see this show highlighted on the Oprah Network. Lisa Beres is so polished for a show of her own. I love her passion for health and wellness. I also love the ease of how she delivers her message. Genevieve- thank you so much for your positive comments and words of encouragement. We have dedicated our lives to improving the lives other others by education and inspiration. A healthy home means a happy person or people living there. Although we reach thousands through GreenNest.com and our books & Cd’s, this show would really help us to affect millions of people in such a positive way. Everyone should have the gift of optimal health. Relying on medications just to ‘get by’ is not the solution. We must look at the causes and Americans spend 90% of their time indoors. It’s time look at our homes, schools and offices and create healthier spaces for all of us — to breath, laugh, live, grow and nourish our souls! Saw your video and loved it–so any people need help with this. In the preschool business, we see more allergies than ever before and so many children on medication. This trend needs to be reversed with a more holistic approach. Keep up the good work. Lisa, Your video is AMAZING! How could Oprah NOT love you? I am so proud of you! Wow, growong up in the same town…but now I have a 6 month old granddaughter! My husband and I own a health food store! (He is the SMART one, I just make the coffee, ORGANIC!) SO MUCH TO LEARN! So excited for you! Good luck! Just reading your one artical, I see so many ways to help my daughter and beautiful grand baby. This is truly amazing!